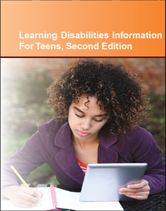 Learning Disabilities Information for Teens, 2nd Edition, describes the signs, causes, and diagnosis of learning disabilities, and discusses the effects of other disabilities and chronic conditions on learning. It also provides coping tips and information on academic issues, assistive technology, and laws that protect the rights of people with learning disabilities. Chapter 1—What Is A Learning Disability? Chapter 3—What Are Some Common Signs Of Learning Disabilities? Chapter 4—What Causes Learning Disabilities? Chapter 5—How Are Learning Disabilities Diagnosed?